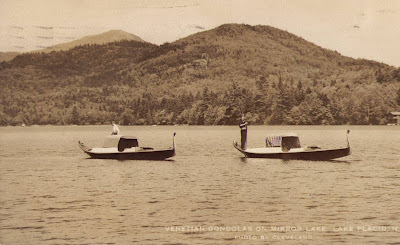 Here's a postcard from 1939, that shows two gondolas on Mirror Lake in the Lake Placid area of New York. - the hull shape and overall length indicate that these weren't Venice-built gondolas. - the rail doesn't really take a curve until it reaches the gondolier's area. 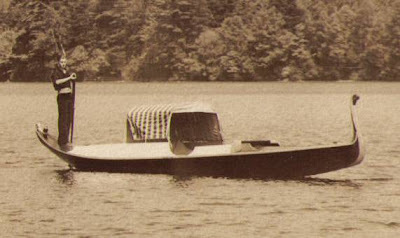 The stern actually reminds me a bit of some of the Hill's Marine gondolas we see here in Southern California. -The piece on the bow (I hesitate to call it a "ferro" because it looks like it's made of wood) almost looks like some of the prows we have on our motorized gondolas here in Newport Beach, CA. - The sunshade-style canopies are unique but clever. I like the one with striped cloth. - there seem to be some sort of "dodgers" along both sides of each boat. It's unclear whether they are wind dodgers or if their purpose is to deflect waves. You can see the half-round cutouts just ahead of the canopy. - Lastly, I'm most curious about how these gondolas were propelled. There are no forcolas visible, and the gondoliers (or at least one) have oars. Either these guys were doing the stand-up paddling like Laird Hamilton, or they had engines on those gondolas. I'm fairly certain that electric motor technology wasn't up to this task in the late 30's, so that would mean they were using small internal combustion engines. If they did, I'll bet they were noisy. 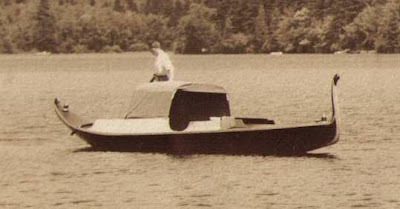 A close-up of the boat on the left. And here's the one on the right. I think the gondolier was just posing for the camera. Chances are that these boats have long since been disassembled. I'd bet money that if they are still in existence, they're not still afloat. There is a slight chance that one or both ended up in dry storage, or even on the roof of a restaurant somewhere. with geraniums growing in it.